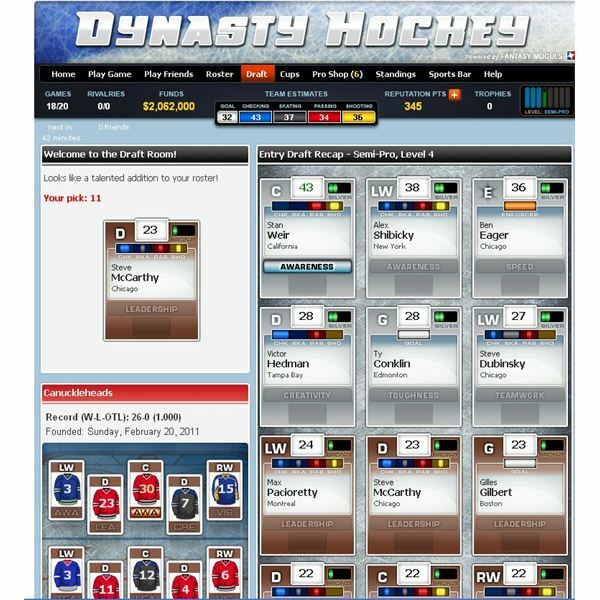 Dynasty Hockey puts you in control of your own hockey franchise. Can you take your team made up of past and present NHL stars to hockey glory? 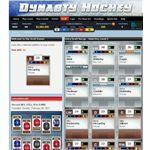 In Dynasty Hockey, you start with a basic team made up of NHL stars from the past and present. You can move your cards around and form different lines with your players. If you win a game, you’ll get access to another player to add to your team. Release old players to add new ones to your squad. Play games and get access to the draft for even better players. Take your squad against other Facebook users and eventually try to win the cup. Play from a beginner all the way up to the pro leagues. Arrange your team with players who have skills in checking, shooting, and more. Once you advance a level in the game, you can take part in the draft. Higher-level players are available at the draft and you can add one new player to your squad. Release an older player to make room for your new drafted player on your team. Once you reach the Pro level, you have access to the trade block to deal players. These transactions are quite expensive so be sure you have enough cash on hand to afford the player. 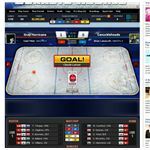 Despite the lack on any real graphics during matches, Dynasty Hockey is fun to play for those who like hockey. There’s great strategy in designing your team with the skills in checking, shooting, passing, in goal, and staking. A few players with good skills can make all the difference in whether you win or lose the match. It would be nice to control the player as you can in a game such as EA Sports NHL hockey but for Facebook the game is challenging and worth playing. The experts you cana ask before the match however make it too easy to win since you can just hit the back button and pick another team to play if you know there’s no chance to win the game. The game features mainly text-based graphics with a few images here and there. There’s no sound in the game and it would be nice to hear some during the match on the rink. Despite the lack of graphics or sound, it doesn’t take away from the game play of Dynasty Hockey. In the game, you can match up against other players or play your Facebook friends. Once you get better, you can also play NPC teams based upon real-life NHL teams from the past and present. Standings are avaialble to see where you are at in comparison to other players. 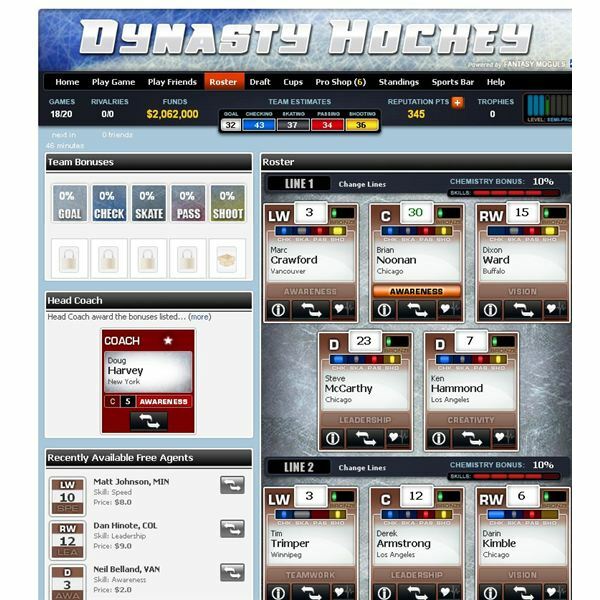 The interface of Dynasty Hockey is easy to use. At the top of the screen, you’ll fins tabs to manage your roster, view the draft, play a game, play friends, view the standings and talk to other players. It’s easy to move players onto new lines and make trades and other alterations to your team with the simple cards for each player. 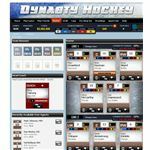 While Dynasty Hockey is mainly text-based and it could use some graphics the game is solid and fun to play for hockey junkies. It’s fun to set up your team of past and present NHL starts and see how they do against each other. It would be nice control your players in the game. This is one title that will keep you busy for sometime and hopefully soon we’ll see a more graphic intensive hockey game on Facebook to play.. 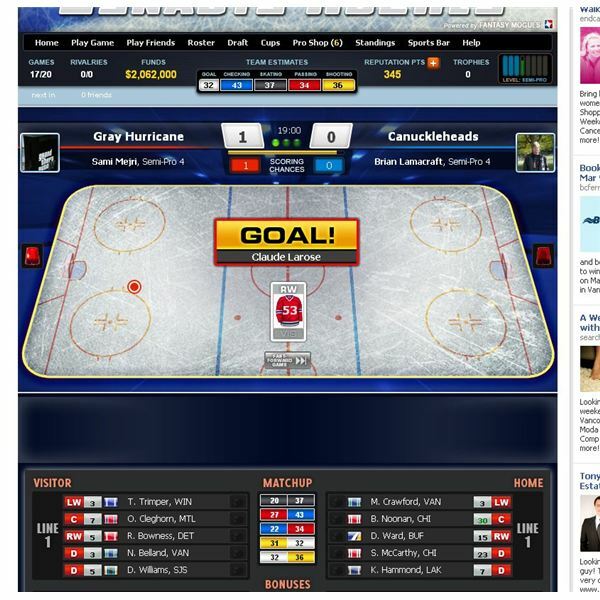 Source: Article is author's own experiences playing Dynasty Hockey on Facebook.